MARADONA used to be a genius. Nowadays, he’s a complete clown. His slide has been long and tragic, with one shambolic episode after another. But the way he has behaved during the World Cup is a new low. Forget about the “Hand of God”, I reckon he believes he IS God these days. There’s no other explanation for his antics. Seeing him going off his head at Argentina’s game against Nigeria, giving the middle finger to fans from his private box, was bad enough on its own. But when you throw in the fact that he was paid to be there as a FIFA ambassador, his behaviour becomes nothing short of shameful. Obviously, I’m not going to criticise people for having a wee drink now and then. But when you’re paid to be somewhere, you shouldn’t be in the sort of state Maradona was in. And was it only alcohol? Given his history, it’s inevitable that people will speculate. He made himself a laughing stock that night. Yet he still wasn’t ready to stop making a fool of himself. After stepping over the line at the Nigeria game, he jumped miles beyond it after England knocked out Colombia. Now, it’s fair to say the Argentinians hate England. With their team out of the tournament, Diego maybe spotted an opportunity to curry favour in his home country. But publicly suggesting the Colombians had been the victims of a “monumental theft” was a ridiculous course of action for a man in Maradona’s position. Once again, he is a FIFA ambassador! And what about the aforementioned “Hand of God”? 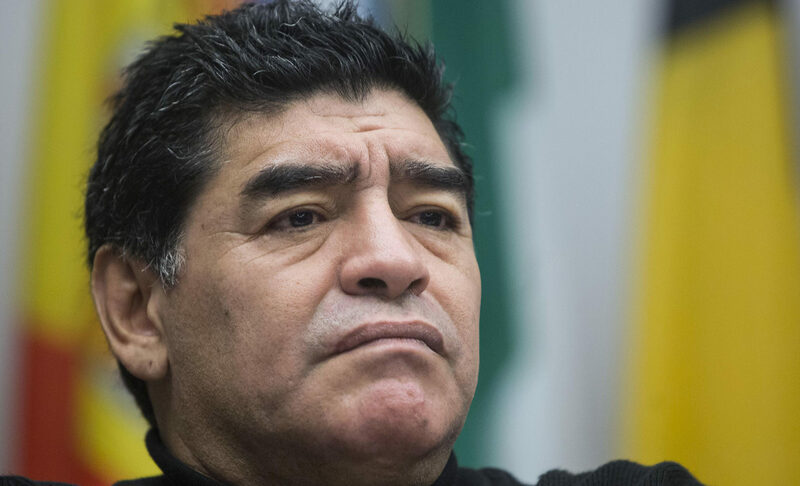 For Maradona to accuse anybody of cheating is both completely stupid and totally hypocritical! The most famous moment of his footballing career involved a “monumental theft” perpetrated by him! Honestly, what must he have been thinking? It’s so sad to see what has become of the guy because he was an incredible footballer. I never got the chance to take him on during my career. But in 1979, the year before I won my first Scotland cap, Argentina came to Hampden with Maradona in tow. He was only 18 at the time, but he was an absolute phenomenon even then. My Ipswich Town team-mate, Johnny Wark, played for Scotland that day, and I remember him telling me that Maradona was so good, all he could do to try and stop him was kick him. It didn’t work because the wee man scored that day as Argentina won 3-1. It was his first international goal. Nobody needs reminding of what he went on to achieve in the game. He remains arguably the best player of all time, ahead of Pele, Messi, Ronaldo and anyone else you care to mention. My mate, Ossie Ardiles, will tell you until he’s blue in the face that Maradona is the greatest ever. He absolutely loves the guy, to the point that he won’t hear a word against him. But I can’t ignore what has become of Maradona since the end of his playing career. He has lurched from one embarrassment to another for years. He has been forced to say sorry to FIFA for his latest offence. Sadly, I don’t think we’ll be waiting too long until he owes somebody else, somewhere else, yet another apology.